PowerBlocks are the heaviest, most compact, and easiest to use adjustable dumbbells ever made. This versatile product can replace an entire rack of fixed-weight dumbbells, and requires only 3 square feet of floor space! For weight training, nothing beats dumbbells, and this is the best adjustable dumbbell ever made. It makes it easy to quickly switch weights, which is necessary when you're getting in a fast workout or training with a partner. And, unlike other adjustable dumbbells, PowerBlocks feel well-balanced and rock solid, with no loose parts or annoying wobble. Every part of this product is well made. If you're setting up a home gym, this is the very first training tool that you should invest in. If you want to get stronger and more powerful, or you want to change the shape of your body, resistance training is your answer. And if you want to see the maximum gains in the shortest amount of time, it's crucial that you train with free weights. Compared to any conventional exercise machine, free weights provide more stimulus to both your muscular and neurological systems. With free weights, your body must continuously contract other supportive muscles to stabilize and coordinate the lift. This coordinated recruitment of muscles leads to more rapid gains in strength than can be accomplished by any other means. Both barbells and dumbbells can be used for free weight training, but because dumbbells are independently controlled, they create the greatest level of muscular stimulus. There are two basic types of dumbbells  fixed-weight and adjustable-weight. Fixed-weight dumbbells are the type that you find in commercial gyms. They're compact and durable, but each one provides only a single weight. To accommodate the needs of different exercises, it's necessary to have fixed-weight dumbbells of many different sizes. Sets of fixed-weight dumbbells are typically arranged in long racks, use up a considerable amount of floor space, and can cost several thousand dollars. Many adjustable-weight dumbbells can not be changed quickly. Some even require the use of separate wrenches or special tools to make the adjustment. This slows down your workout, and quickly reduces the dumbbells' benefit. Most adjustable-weight dumbbells hold their weights in place with some type of locking collar. These collars often do not hold the weight plates tightly together. The result is a loose weight assembly that feels awkward and unbalanced in your hand. Sometimes these collars break loose, creating a safety hazard. Other times, the collars lock so tightly that they're nearly impossible to disassemble. Most adjustable weight dumbbells have a center shaft that extends far enough to accommodate several additional weight plates and the locking collar. However, this extended shaft makes the dumbbell larger than is desirable, and can interfere with the performance of many exercises. PowerBlock is the only dumbbell without ANY of these limitations. PowerBlock's weight can be adjusted in seconds, without tools. PowerBlock's adjustment is always safe and secure. 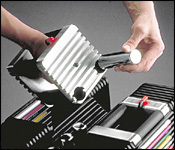 And PowerBlock is even more compact than most commercial dumbbells, as can be seen in the image below. See the dumbbell immediately to the right of the PowerBlock in the above photo? This "SelecTech" dumbbell was manufactured by Nautilus/BowFlex, and has a plastic dial on each end which is used to select the weight. Not only are these dumbbells larger and more cumbersome than PowerBlocks, but their selection mechanism is also extremely fragile. Drop this dumbbell just one time on your carpeted floor, and it's likely to never function properly again! You'll see this type of dumbbell in many fitness and department stores, but it's a poor choice for your home gym. Dial-type dumbbells are also only available in weights up to about 50 lbs, so if you're a reasonably strong man, you'll quickly outgrow them. 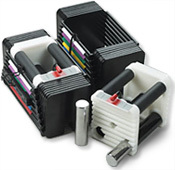 PowerBlocks, in contrast, are available in weights up to 90 lbs per hand (or even more on special order). Dumbbells are the best exercise tool you'll ever invest in. Purchase a quality set that's made to last, and has a weight capacity that exceeds your current abilities. The square shape of PowerBlock's weight plates allow more weight per plate (due to the corners that weren't cut off). This means that more weight is concentrated near the handgrip, resulting in a shorter dumbbell that's better balanced and easier to control. When you do seated dumbbell curls, you'll really appreciate this design feature. With many other dumbbells (including Nautilus' SelecTech), it's nearly impossible to do seated curls without banging the end of the dumbbell into your leg or bench. But with PowerBlocks, you'll perform every exercise smoothly and efficiently. Easy on your thighs. Have you ever used the top of your thigh to help kick a dumbbell into position for doing heavy exercises like incline presses? The small ends of most adjustable dumbbells can leave bruises, but the big, smooth, flat, square ends of PowerBlocks are easy on your thighs. Won't roll away. Floors are suppose to be level, but often they're not. So when you set a round dumbbell on the floor between sets, it has a tendency to roll away. That gets irritating after a while, and can put gouges in the surrounding furniture. PowerBlocks' efficient shape guarantees that they stay exactly where you put them. Adjustable from the floor. Most dial-type dumbbells can only be adjusted after they've been returned to their specially-shaped cradle/stand. PowerBlocks, because of their square, flat bottom, can be easily adjusted while on any flat surface, including the floor. That means that you can quickly change weights between sets without returning them to their stand  perfect for "strip sets" or "pyramid training". After just one workout, you'll realize that square is the ultimate dumbbell shape. Each PowerBlock dumbbell uses a central "core" handle, which weighs 5 lbs. Special cavities in the lower portion of the core accept up to two additional 2.5-lb adder weights, which slide easily into place. The use of these adder weights is optional, but allows you to make smaller incremental adjustments of the selected weight. The core slides smoothly into the center of a series of nested steel weight plates. A unique selector pin, on one side of each PowerBlock, allows you to quickly and easily change the selected weight in steps of either 5 or 10 lbs (depending on which model of PowerBlock is being used). Weight changes are instantaneous, there are no extra parts to tighten, and the color-coded bands make it easy to see which weight is selected. 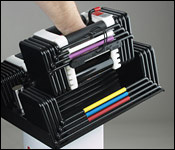 The top of the PowerBlock is open to allow easy access for either large or small hands. At the center of the core is a firm textured handgrip that provides a secure, non-slip grip. Grasp the handgrip and lift upward. Your selected weight slides smoothly free of the remaining stack. The selector pin securely locks the weight plates to the handle with multiple points of contact. The pin won't come loose, no matter how fast you move or shake the dumbbell, what exercises you perform, or how much weight you use. This really is the ultimate combination of security and adjustability. PowerBlocks are Protected by an INCREDIBLE 10-Year Warranty! "For the first ten years from the original date of purchase, if the weight plates, handle assembly, or frame should crack or break, it will be repaired or replaced by Manufacturer." Which PowerBlock Set is Right for You? This is the one the big boys use. It includes the core handles, eight 10-lb nested plates, and four 2.5-lb adder weights. The Elite Set adjusts from 5 to 90 lbs per hand, in 5-lb increments, and provides the equivalent of 28 pairs of dumbbells. Best value for most men. This set is perfect for anyone that doesn't need the full weight capacity of the Elite Set, but wants an even finer degree of adjustability. The Personal Trainer Set is identical to the Elite Set, except that each nested weight plate is 5 lbs instead of 10 lbs. It adjusts from 2.5 to 50 lbs per hand, in 2.5-lb increments. Best value for most women. Note: PowerBlock also manufactures smaller, lighter versions of its dumbbells  e.g. the SportBlock and the Personal Set  which you'll find on many other websites. We can special order those models for you, but we don't stock them because the above two models provide so much more capacity and value. Your PowerBlocks can be stored on the floor or any other flat surface, but this stand holds them at a convenient height (for easy lift-off), and keeps your four adder weights nicely organized. It's constructed of heavy-gage powder coated steel, and is an attractive and classy way to display your PowerBlocks. A good adjustable bench is a necessary component for performing many chest and shoulder exercises. This heavy-duty bench adjusts from flat to 30-, 45-, 60-, and 85-degrees of incline. It's constructed of 2"x3" 14-gage steel tubing, with tapered upholstered cushions that will withstand years of heavy use. It also now includes integral wheels and lift handle for easy moving. This optional welded-steel accessory slips into the back of the SportBench frame (with the bench back raised in the incline position). It allows you to easily and securely perform dips off the back of your bench. Weight rating: 250 lbs. See assembled view. Fits PowerBlock SportBenches manufactured after May 2008. The Workout Poster Pack includes five different 12"x18" laminated posters, which clearly illustrate PowerBlock dumbbell exercises for all body parts. These posters are an economical way to decorate the walls of your home gym, and provide a quick reference for both beginning and advanced trainers. Try PowerBlocks in Your Home Risk-Free! We've been one of PowerBlock's top dealers for many years, and we're proud to offer great pricing and excellent service on this product. We also supplement PowerBlock's warrantee with our own Complete Satisfaction Guarantee. That allows you to try them in your home for 90 days risk-free. If they aren't right for you, simply return them to STI for a full refund. As a PowerBlock dealer, we're only allowed to ship PowerBlocks to customers in the continental United States. We apologize for any inconvenience this imposes on our customers outside of that area. Adjusts from 5 to 90 lbs per hand, in 5-lb increments. 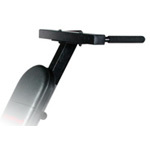 Adjusts from 2.5 to 50 lbs per hand, in 2.5-lb increments. Holds and displays your PowerBlocks at a convenient lift-off height. Heavy-duty, with 5 adjustments from flat to military. Converts SportBench into a dip station. Includes five different 12x18-inch laminated dumbbell training posters. "I believe PowerBlock dumbbells are the most impressive, cost effective, space saving, ingenious fitness product that I have seen in years. Many friends have asked me to assist them in getting into shape. I always stress the importance of a balanced approach to fitness that includes a nutrition program, aerobic exercise, and resistance training. And since the day a friend showed me his PowerBlocks and I ultimately purchased a pair and began using them, I became a quick convert and evangelist of PowerBlocks. 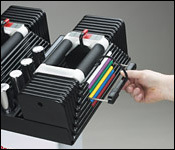 I always recommend PowerBlocks to my friends for their home resistance training needs and none have been disappointed." "Thanks for producing such a great product. Your PowerBlocks can't be beat!" "You have made what should be considered the centerpiece to any home gym! I chose the Elite 90 to help reclaim space (a good portion of my garage) from hex and Olympic dumbbells, stands, and plates. The space savings is huge and let me move my workout area to a smaller bonus room in the house which means AC in summer and heat in winter. What I didn't expect is the time savings to my routine! Not swapping plates has sped up the weight changes so much I feel like I have forgotten to do something. Thanks to your PowerBlocks I have managed to reclaim my garage, move into a climate controlled workout room, and cut time off my workouts. These are without a doubt the best addition I have made to my home equipment." "I have had Power Blocks for almost three years and love them. I couldn't imagine using any other dumbbells (even the Bowflex ones, which look nice, but I can see some inherent problems in them with respect to size and durability). You have a great product and all my weight training (three times a week) is done using them." "PowerBlock is the only in-home dumbbell set I use with my personal training clients! PowerBlock enables me to do an entire full-body workout with clients; regardless of their fitness levels. whether it's their first workout or after years of training. PowerBlock is safe, compact, and easy to use. thanks to PowerBlock I am able to make 'Results Matter'! Using PowerBlocks with my clients I really 'raise the bar'!" "I am a Personal Trainer and attribute a great deal of my success to my PowerBlocks. Their price no where near reflects the value. The advantage of being able to carry a whole gym in two hands to my clients anywhere, is priceless. I know with confidence I can offer the best of workouts with the ultimate tool for fitness. This is my third set, I find I lose my blocks when I put them in my clients hands..."
"The best investment I've ever made."